Tilt-up shot of happy young family pushing shopping trolley full of tasty food through supermarket. Child is having fun, parents are smiling and looking around. 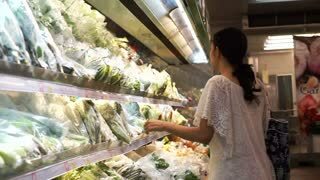 Young pertty brunette is walking in hypermarket and pushing shopping trolley going to buy food and looking around at shelves with products. 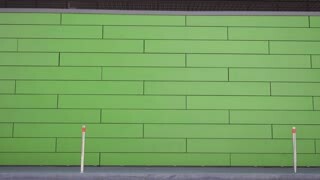 People and shops concept. 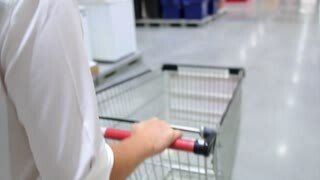 Attractive woman is driving shopping trolley through food department in supermarket and looking around. Pretty girls, everyday life and buying products concept. 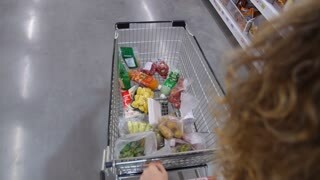 Side view of cheerful family mom and son walking in supermarket with shopping trolley choosing fruit and talking. Parenthood, childhood and buying food concept.